GT85 400ml & 200ml spray. 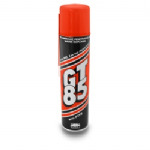 Our original product; GT85 is a general purpose cleaning/lubricating spray. With its CFC-free propellant, GT85 is environment-friendly and is ideal for anywhere non sticky lubrication / Spray Maintenance is required.